When The Shattered Empire update his Blade & Soul’s servers on April 27, it will add three new pieces of multiplayer content to the game. This content includes two new endgame dungeons — Sogun’s Lament and Cold Storage, and a new PvP mode titled Whirlwind Valley. 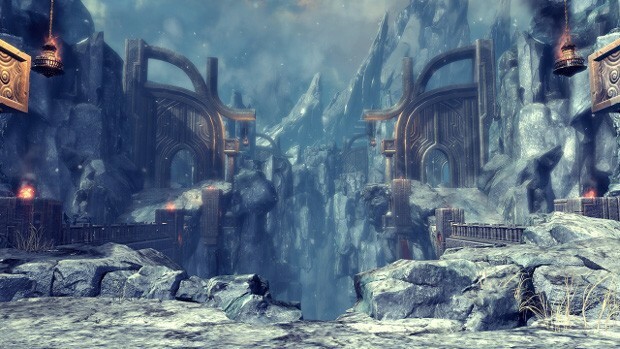 Sogun’s Lament takes place in the ruins of a palace in the Silverfrost Mountains. There you will learn about Prince Sogun’s past and help put his spirit to rest. The Blade & Soul devs state that this is the most difficult piece of the content, but it will be worth it for the weapons and other gear. Cold Storage, on the other hand, is a daily repeatable dungeon — which can be done more often if you elect to purchase a reset through the store — that offers a consistent set of rewards for a more relaxed dungeon run. The second boss is totally optional, and only spawns when the players initiate it. Players can earn everything from weapons to skillbooks and recipes. As for Whirlwind Valley; this is a new 6v6 point capture PvP mode that players can compete in to earn Battle Points used to purchase rewards from the Battlefield Traders. The first team to 1800 points (or the one with the most points when the time runs out) wins. Unlike other modes, the players’ gear is not equalized, meaning that the quality of your gear can help or hurt you as the case may be. More information on all of these additions can be found on the Blade & Soul site. Nice game..one of few f2p that worth the time.Ty for the news QuintLyn. Do people actually play this game still? After black desert Came out I haven’t touched the game. Black Desert? That game born Death xD. BD have around of 4000 bugs confirmed, worst market ever and incredible boring quests system. BD is only a Eden Eternal with better graphics. BnS is totally different.